There is no secret as to why he stays. Limon mixed the jams, sent a copy to Trueba, who by then had set up his own record label (Lola). They were both so impressed by the new ground covered by the informal musical exchange that they decided to release the CD. Jerry González y los Piratas del Flamenco was released to great acclaim in Spain in 2003, and it came out on Sunnyside in the U.S. this past June. The CD is a combination of cutting-edge flamenco mixed with González’s command of bebop, with a dash of Afro-Cuban thrown in. Flamenco guitarist Nino Josele and percussionist Israel “Pirana” Suarez are González’s principal accompanists. El Cigala sits in on two cuts, lending his dark, rough-edged flamenco-singing style to the mix. But the album’s crowning achievement is the flamenco take on Charlie Parker’s “Donna Lee” (spelled phonetically in Spanish on the CD as “Donnali”). 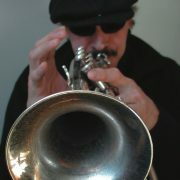 As he does on most of the CD, González is doubling on conga while he works Bird’s bebop tongue-twister on trumpet. Guitarist Juan Jose Suarez “Paquete” shadows him note for note but with a decidedly Roma accent. González seems to have found a place for himself within the small circle of adventurous Spanish musicians, and the club dates, sessions and a set of quartet recordings are taking their toll on the veteran musician-for the better.